A business model should not be based on profiting from customers’ misery. Yet payday and car-title loans are designed to trap borrowers in a cycle of re-borrowing and debt, often charging interest rates of more than 300 percent. Four out of five payday loans are renewed or “rolled over” within 14 days. There is an array of better credit options, including credit cards and small loans from credit unions. 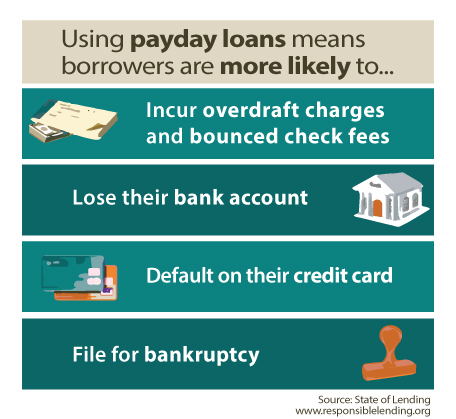 Taking out a payday loan makes a person more likely to delay needed medical care, incur overdraft charges, lose their bank account, default on their credit card, or file for bankruptcy. The payday industry preys on financially vulnerable people and worsens their financial problems. The Dodd-Frank Wall Street Reform and Consumer Protection Act of 2010 established the Consumer Financial Protection Bureau to stop the types of financial abuses that led to the 2008 crash. The law provided the consumer watchdog with explicit authority over payday loans. As this timeline shows, over the course of more than five years, the CFPB laboriously conducted research and analysis, engaged with and took advice from the public and a variety of stakeholders, developed, and finally, in October of last year, issued an administrative rule that reins in the payday loan debt trap. The Payday Rule adopts a commonsense way to disrupt the debt trap: lenders would have to verify a borrower’s ability to repay a loan. This requirement has overwhelming support from voters of all political persuasions. The Payday Rule would prevent many Americans from facing financial despair – and yet, it might be killed before it even starts going into effect. Congress thankfully missed the deadline to vote on a Payday Rule Congressional Review Act resolution, which would have completely repealed the rule and blocked agencies from issuing a similar one. That this Congress chose not to vote on the measure reflects how incredibly unpopular it would have been for members of Congress to clearly side with payday lenders over their own constituents. However, the rule still faces existential threats from litigation and from new leadership at the CFPB. Recently, the leading payday lender association filed a lawsuit, which included the allegation that the CFPB “rushed to finalize the rule.” The CFPB’s acting Director Mick Mulvaney, who was, some believe, unlawfully appointed by President Donald Trump, echoed this payday lobby talking point at a congressional hearing. He claimed there were “questions as to whether or not [the rule] had been rushed.” My fellow Virginian, Sen. Mark Warner, pointed out that “this rulemaking took a number of years,” “was a subject of a great deal of scrutiny,” “there was industry as well as consumer input,” and “there was a great deal of work that went in[to it].” Indeed, this was conscientious, responsible, careful hard work by career professionals at the CFPB who extensively documented a problem and developed a fair rule that helps solve it. In stark contrast, Mulvaney has been taking a wrecking ball to consumer protections. For instance, he ordered career staff to drop a case against a payday lender making deceptive, 950 percent interest loans. Under his leadership, the bureau announced that it “intends to engage in a rulemaking process so that the [b]ureau may reconsider the Payday Rule.” This is the first step toward dismantling the measure. Mulvaney signaled this intent when he had called for Congress to pass the CRA. He has also made clear several times that he doesn’t even want the CFPB to exist. This is a direct attack on working people. It is worth noting the contrast in tone with the way Mulvaney spoke to wealthy bankers in April when he told them that, when he was a congressman, lobbyists could buy access to him by contributing to his campaigns. One of the essential functions of government is to prevent the wealthy from exploiting the poor. This administration should start fulfilling that function and keep their hands off the Payday Rule. Congressman Don Beyer (D-Va.) represents Virginia’s 8th District in the House of Representatives, where he serves on the Joint Economic Committee, and previously built a successful small family business in Northern Virginia.